Is it just me or is walking a 5k so much harder than running a 5k? I can’t tell you how many times I asked Kelly if we were at the finish yet. It was great to come together in memory Adam and to catch up with the entire family especially since most of the reminiscing revolved around the baking experiences from our childhood. Kelly and I were always making a mess in our parent’s kitchens creating recipes that no one, not even us, were able to eat. The one time our brownies exploded in the oven? Well that was because we subbed a cup of baking powder for regular flour because we ran out of flour and figured they were both white so it would work. After the walk, we headed to Bagel Boss which just so happens to be next to a Red Mango but once again, Red Mango let me down because not only did they not have their standard Nature’s Path Pumpkin Flax Granola but they didn’t even have their standard original yogurt (or pomegranate or any of the greek flavors). Like what the heck Red Mango, get your act together before you lose me! 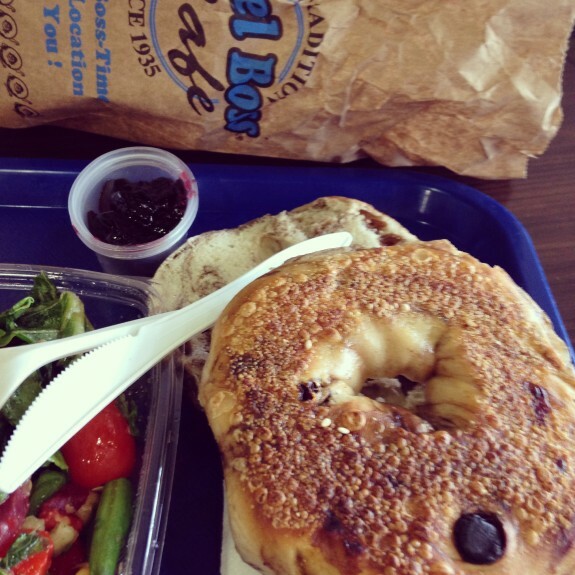 No problem really because I was actually craving a giant cinnamon raisin bagel anyway. Kettle cooked bagels are the best bagels and if you are going to bother to eat a bagel it should be right. The best thing I ate all weekend though happened two nights in a row and I don’t see the trend stopping any time soon. 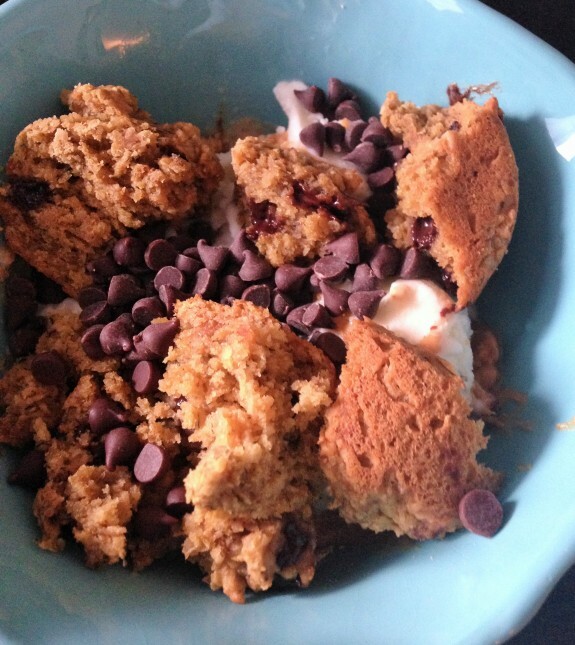 I baked the most delicious PB & Pumpkin Oat Bran Muffins and the dessert genius that I am decided to toast one, crumble it up and add it to a bowl of Trader Joe’s Light Vanilla Ice Cream with extra dark chocolate chips and a spoonful of peanut butter. Let’s start at the beginning with how I ended up with a batch of the muffins. I had a pile of slightly overripe bananas staring at me as I typed up Friday morning’s post so once I hit publish, I set my oven to 350 degrees and got started. Totally normal to bake before the sun rises, I know. When I feel like baking, I often start with one ingredient and go from there. Sorta like Kelly and I did as kids only I finally got the hang of it. Along with the bananas went pumpkin and Mighty Maple peanut butter which give the muffins a fall feeling. I am in love with the texture. One bite reminded me of the moist yet crumbly yet completely held together mushy yet firm feeling of an Entenmann’s Corn Muffin. Please tell me you grew up on Entenmann’s Corn Muffins? Straight from the box or toasted and sliced up with peanut butter? Okay, so even if you have no idea what I am talking about, even if my sheltered New Yorker mind believes Entenmann’s is sold throughout the world and even though these muffins have absolutely nothing to do with corn, you need to make them anyway. There’s no egg or butter or oil involved here and the sweetness comes from the bananas, pumpkin and peanut butter. 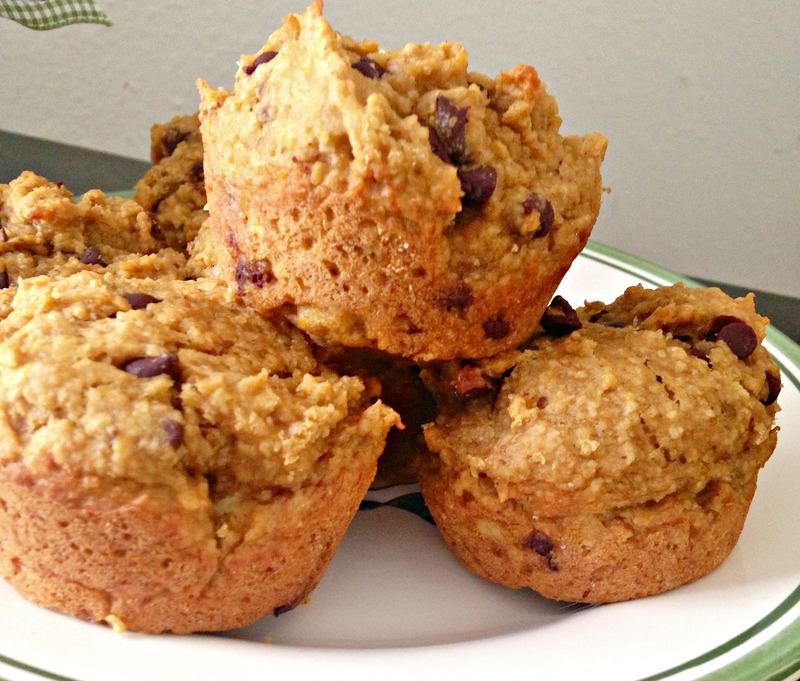 These muffins can be made vegan if you use almond milk in place of the organic skim and nondairy chocolate chips in place of the dark. *You can sub with maple almond butter. If you do not have a maple nut butter on hand, use any nut butter of choice and add two or three tablespoons of pure maple syrup to the batter. 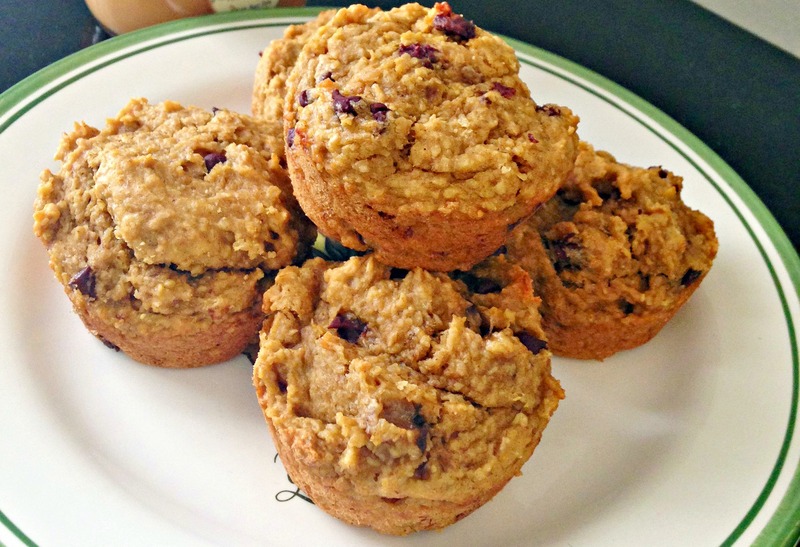 You can add more or less depending upon how sweet you wish to make your muffins. 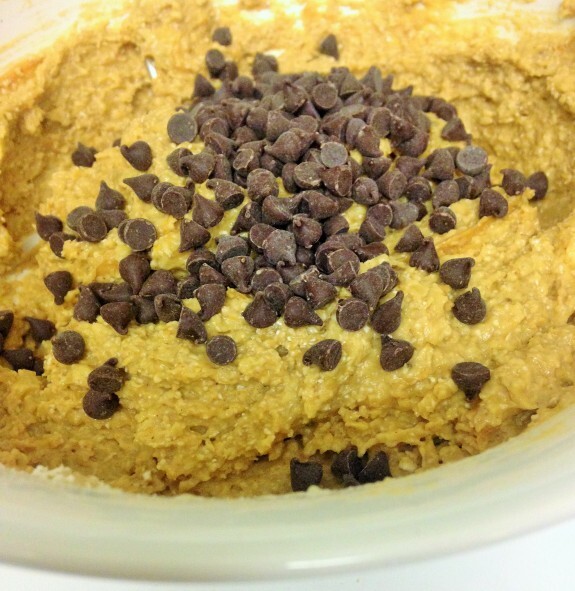 Once mashed, add the pumpkin, milk and 1/3 cup of peanut butter and mix together. Add in the whole wheat flour, oat bran, baking soda, sea salt and cinnamon and mix. Sprinkle in the dark chocolate chips along with the extra spoonful of peanut butter and give one final mix. Spoon into lightly greased muffin tin and bake for twenty minutes or until the tops of the muffins are springy to the touch or slightly golden brown. Do you find it easier to run miles or walk miles? Did you run a race over the weekend? How did it go? If you had to select one muffin from a bakery case, which would you choose? Totally a chocolate chip. I find it so much harder to walk. I also find it hard to intentionally run slow. Sound crazy? Might sound crazy to others but not to me! I am the same way. Although, if I had to choose between walking or slow running, I will side with slow running. I absolutely despise walking. 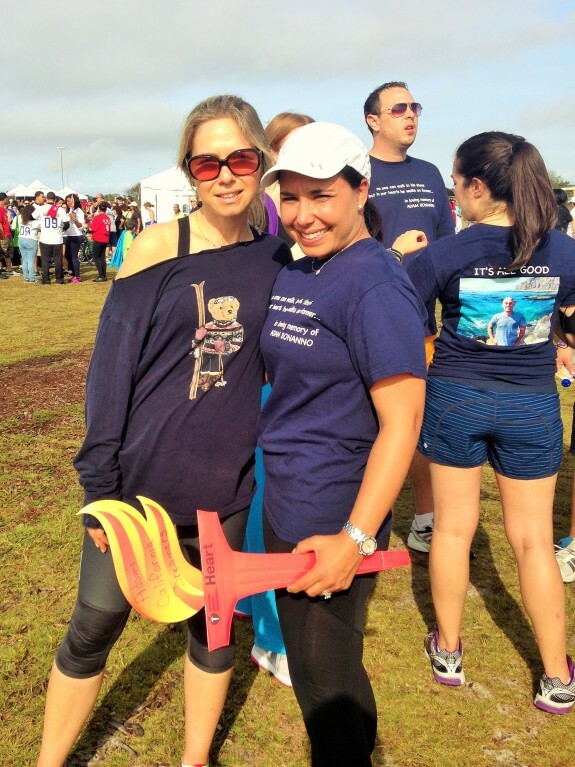 I walked a half marathon with my mom this spring. I can tell you that if I hadn’t been pushing her through it, I would have called it in long before we were done (also becuase I was cold, but that is another thing). I haven’t dabbled in Oat bran yet, but it is next on my list! Oat Bran is definitely a pantry staple. I actually said yesterday that I give people who walk half marathons major credit. I really don’t think I would make it! Amanda @ .running with spoons. recently posted…. pumpkin pie breakfast bake . I laugh out loud every time I think of what Kelly and I used to do. It was bad and hysterical and the stuff memories are made of for a lifetime. Our parents were ready to kill us. Literally. That brownie explosion was epic. If the muffins were warm, I’d pick a chocolate chip. but I love me some blueberry muffins too. Isn’t it funny the things we learn growing up in the kitchen. Once I tried to freeze lettuce because I didn’t want it to go bad… it doesn’t work. I also made a whole pot of blackberry dumplings accidentally using salt instead of sugar. The things I used to do in the kitchen still make me laugh out loud. Oh the memories of some really fine disasters! And Mighty Maple is really hard to NOT eat straight from the jar! Major will power necessary but worth it to make the muffins. I really like them. I have definitely used salt instead of sugar when baking on more than one occasion…oops! And I absolutely love walking and despise running. I could walk for miles on end, but I can’t run for more than 30 seconds without wanting to stop. Shannon recently posted…We Pay Money For That? Isn’t it amazing how different we all are? I hate walking anywhere! I fear red mango may go under if they lose you as a customer!!! They had better get it together! 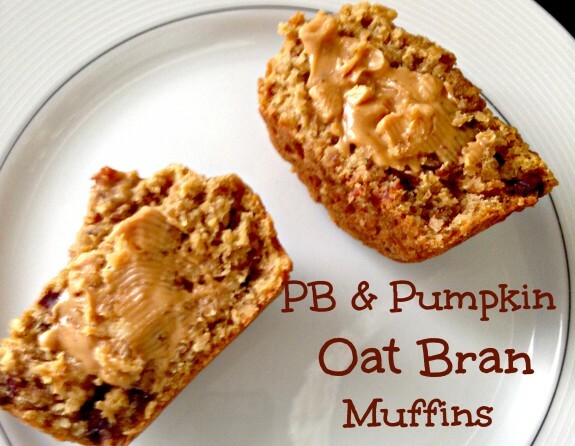 Muffins sound wonderful, love that you combined PB and pumpkin, I haven’t tried that combination yet. As for walking vs running, yes I agree! It is harder to walk, and makes your legs more sore….well mine anyway! Yes, my legs were feeling much more sore towards the end of the walk vs. if I had run the same distance! Crazy lol…You must combine peanut butter and pumpkin. It’s a terrific combo. haha yes, that is a great nightly trend, but i need to be invited..ok? I should have everyone over for an ice cream muffin bar…Wouldn’t that be a fun party? event. Tbough probably would do it for a friend. I “defended” my age group 1st place at the Saratoga Palio 5k . I like a cinnamon muffin with that sweet cheese, like in a cheese danish. That’s awesome! Congrats on a great race. Oh my gosh, firstly, you have the best blog design! So cute! secondly, love these muffins… PB with everything is my motto! How about run and walk! Haha, I dont have much patience, but I don’t like running long! Carrie (This Fit Chick) recently posted…The Start of Daily Blogging! Aw thank you! I really like how my site came out when I redesigned a few months ago! 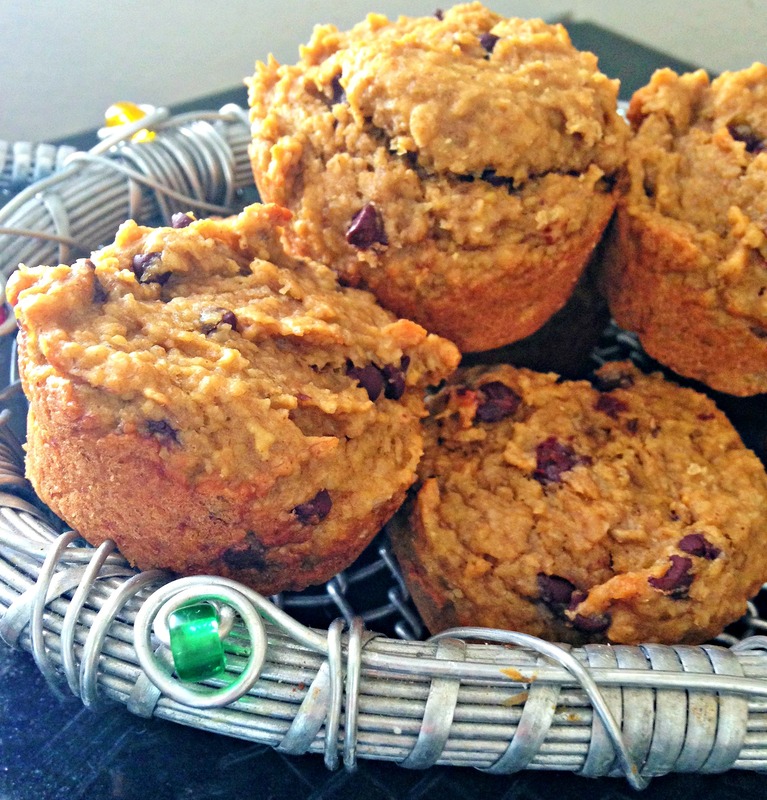 These muffins really are terrific, let me know if you try making them.